I reckon I am jinxed as an airsoft player. All the times I have said that mesh is safe I might have been wrong. Currently sat in A.E waiting to get the chunk of bb thats embedded in my eye removed. Where's Ian when you need him eh? I am sure it will be fine. 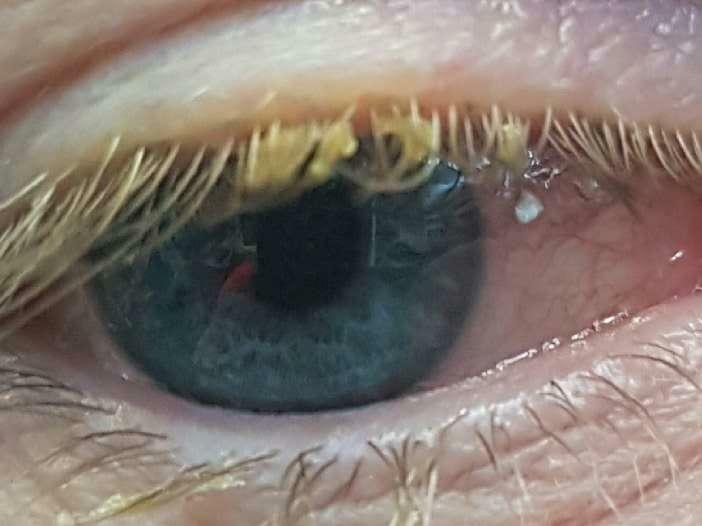 Washed it out after it happened and didn't realise that a bit had actually penetrated the eye, just thought I had scratched it. Spent all day playing with it and only realised something was wrong when my eye started weeping yellow crap in the evening. Mind if I share your story and photo as a warning? That scared me to bits mate, wish you fast recovery mate. Don't think a warning is really necessary. It was a 1 in a million. I have used that mask a 100 times and never had an issue. It was probably someone using crappy bbs that was real cause. Damn straight I am playing Saturday. Anyone ever done a pirate loadout? That is Bad luck and I hope its sorted out with no complications for you asap. Just the thought of that happening is exactly why I don't wear mesh even though fogging is a bloody nightmare at times! Bio BB's are quite prone to doing this and some sites now insist on bio so the risk of it happening I can only see getting higher! All anyone can do is take every precaution to make sure it doesn't happen but we cant unfortunately check everyone's ammo is of acceptable quality! I didn't booked Saturday but I did book Sunday, so see you there, if you playing that day also. I am all good they removed it and after a couple of weeks of eye drops it will be all good. Will say though that the anesthetic they use don't do much because I felt the needle go in and it really wasn't fun. Main thing is my vision should be good for Saturday as I can't use my red dot with just one eye. It was only part of a bb anyway not a whole one so nothing too serious. Unfortunately unless you have worn those goggles a million times looks like the odds are a bit less than that. Alas you cant always rely on people using the BBs your mask prefers and whilst I always took "bio bbs can shatter and get through" with a pinch of salt your experience has shown it does happen. I was considering mesh myself but think this has swung it for me, the chances of it happening are low, but the fact is it only has to happen once. Yeah it can happen but it hasn't put me off using mesh. I will still use the same mask again as I know the risk is low. I am an aggressive player who will run at groups and regularly go low so my face and head have had countless bbs bouncing off them and this is a first and I still think my head gear is the best I can use for how I play. At the end of the day the mesh worked, the bb broke up and lost most of its force so the damage was minor. It hasn't put me off mesh or airsoft and won't affect how I play so it shouldn't anybody else. Stairs on the other hand are deadly so stay away from those. Not a bad selfie though. Hope that it heals fast. Could not imagine it slowing you down or stopping you from getting stuck in, pirate patch or not. Eeek get well soon mate!! Ouch I hope you have a speedy recovering. Big ouchies!!! can I ask what Mesh were you using? It's fine now once the fragment was removed it calmed down pretty quick. A bit of soreness but not much worse than sand in the eye at the beach. Thankfully the sclera heals fast! This is one of many reasons I don't do mesh though, while the chances of serious eye injury wearing mesh are effectively zero minor discomfort like this is much too likely for me to discount it as a possibility. Hope it all heals up quick Trigger!